Jewelry plays a very significant role in any kind of wedding and when it comes to the bride, the perfect jewelry is most important! When it comes to shopping for your wedding jewelry, there are three things that you must have some knowledge about - FIRST what are the different pieces of jewelry you need, SECOND what are different styles and cuts available and THIRD what suits you the best. Here is some information that we have put together to help you in all the three areas. Here are some of the different ornaments an Indian bride would require for her wedding day. 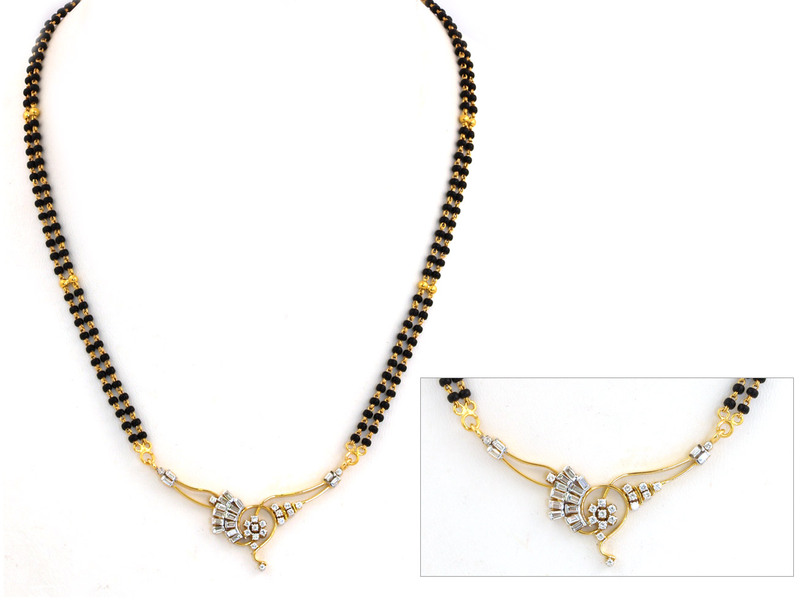 Mangalsutra – The Mangalsutra is a very auspicious ornament worn by Indian women and it symbolizes her marital status. 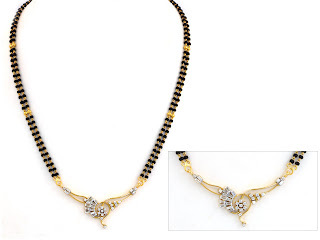 Typically, a Mangalsutra consists of a long chain of black and gold beads with gold, diamond of silver pendant hanging from it. The modern Mangalsutra may have undergone many variations in style and design to suit the contemporary Indian wife, but the underlying significance remains the same. 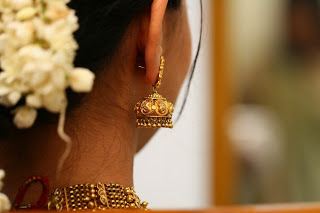 Ear rings – Jhumki or Jhumkas are pretty chandelier shaped ear rings, perfect for a classic or vintage bridal look. Pearl or diamond ear rings also look very stunning on the contemporary bride. The ear rings are usually designed as a set matching the neck piece. Ear pieces studded with beautiful stones, with kundan and jadau work are most popular amongst Indian brides. Maang Tikka – This is a hair ornament which consists of a chain which sits in the center, on the head and a hanging flat or round ornament which rests on the forehead. 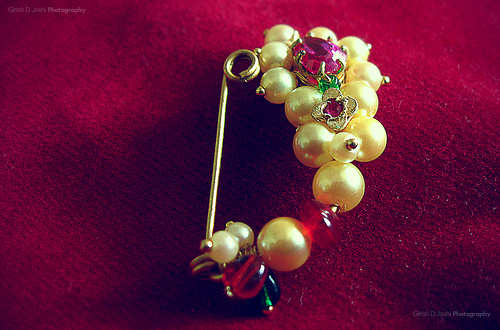 The ornament may be suspended from one or more chains which are attached on either side of the head. The Matha Patti is a mang tikka with beaded strings while the Jhumar or Passa is a mang tikka where the ornament hangs on one side of the head. Nath – The nath is a small ornament worn on the nose and is a must have for Maharastrian Brides. This consists of a small ring, stud or jewel which is pierced or simply clipped onto the nose and may be worn with a chain which is secured to the side of the head. The chain may be a simple string of gold or beads with filigree work or jewels hangings. Necklaces – The neck piece occupies the prominent place in bridal jewelry and very often is a family heirlooms passed on from generation to generation. The styles and designs vary from region to region. Depending on the length, these are called Chokers which sit perfectly around the neck or Haar which consists of single or multilayered chains, often reaching the waist. They are made entirely of gold or silver, may be studded with diamonds or other stones or consist of strings of pearls or colored beads. Rings - Similar to the Mangalsutra in Hindus, some brides and grooms choose to wear a wedding ring, which symbolizes their marital status. 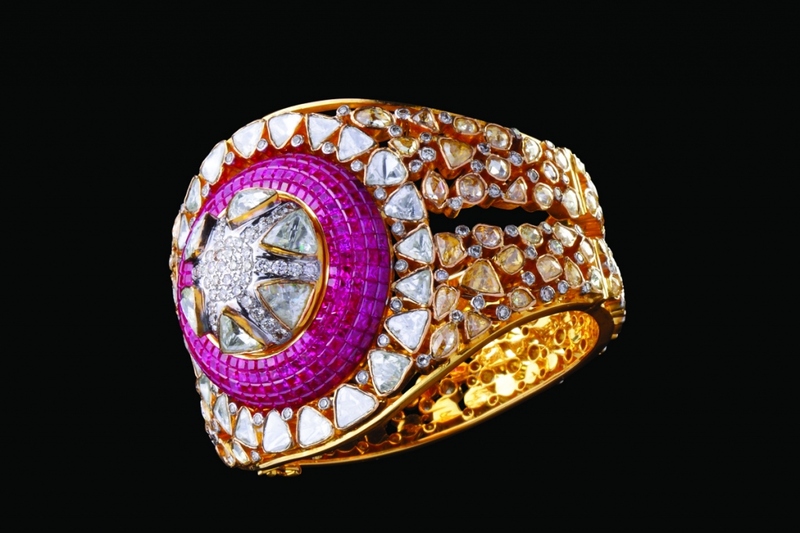 The Arsi or archer’s rings are very famous for their unique designs and royal look. Rings studded with a single diamond or precious stone are often used for proposals and engagements while the wedding ring is usually more decorative. The rings worn on the feet are called toe rings or Bichua. Tagdi / Kamar Bandh – These are similar to waistbands and are beautiful ornaments delicate or chunky bands worn around the waist. This is worn be worn on outfits bearing the midriff, usually a sari or lehenga. These may be made of silver of gold with detailed engraving or filigree work or be decorated with small pendants and stones. It highlights the waist and adds a touch of sensuality to the bridal look. These are available in various designs which can be worn on Indian and western wear as well. 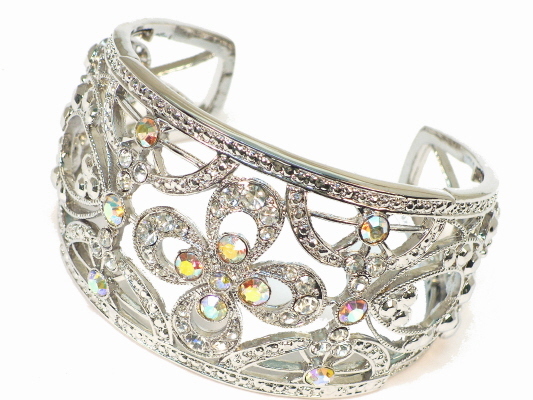 Baju Bandh – Baju Bandh or armlets are very commonly worn in Indian weddings and other traditional functions. These are decorative bands worn around the arm, above the elbow. South Indian brides usually prefer a traditional gold band while north Indian brides wear a jadau, polka or meenakari band. Bangles / Bracelets / Kada – Bangles or chudis are thin metallic bands while kadas are broad bands worn on the hand. Red or green glass bangles are generally worn to signify marital status in some communities. Bracelets are chains worn tied around the wrist. Bridal jewelry is mostly made in precious metals and are decorated with stones, diamonds or simple engraving and filigree work. Haath Phool – Many Indian brides are known to wear a bracelet, which is connected to one or many rings forming a web like structure. This is called the Haath phool and is made of gold, silver or pearls and is embellished with meenakri or kundan work. A similar ornament is may also be worn on the feet where the anklet is linked to the one or many toe rings. Payals – These are delicate bands worn around the feet. These may be made of gold or silver chains with tiny bells or ghungroos hung on it, which make a distinct sound as she walks. These are the common pieces of jewelry worn by Indian brides. Coming up is some more information on the various types and styles of Indian wedding Jewelry to help you decide what suits you best!